In fact, all the masks of commedia dell’arte are entirely comic, tragic mask does not exist here. All came from the stories. They were diverse: pastoral, tragical, catastrophes and horrors. Nevertheless, masks have always played comic roles and were funny. Therefore, have always been popular. The actor, wearing a certain mask, played its character in all performances, freely reincarnating, because he was not limited by framework of role. Instead – a short script. With this freedom of the actors to improvise, released acuity, flirted with the audience and amused them to tears. The audience was delighted. But in northern Italy were their own favorites – Pantalone, Doctor, Brighella and Harlequin. And Southerners chose this company: Coviello, Pulcinella, Scaramouche, Tartaglia, Masks of Captain, love, Fanteski, who were everywhere. It couldn’t be the other way – masks parodied living people with their weaknesses, passions. Therefore, performances always caused a great response from the audience, recognizing their neighbors and themselves in the characters of comedy. 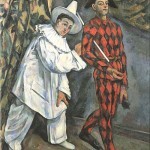 Harlequin appears on stage in a simple peasant dress – white shirt, wide long trousers. Harlequin was poor, his suit patches eloquently spoke of it. On his head he wore a hat with a bunny tail, as the owner it was a coward, but face was covered with black hairy mask with a lump on his forehead. Where did he get this strange lump? Harlequin gives us the riddle. Here begin secrets. The fact is that the progenitor of the Harlequin, Middle French harlequin, or the German Erlkönig “Elf King”, or the Old English Herla “King Herla,” was a figure far from comic but demonic. French legend of 11th century, harlequin was a leader or one of the participants of terrible procession of spirits, so-called “Wild Hunt” demons – ghosts, souls of the dead, speeding over the ground and in hell. Often demons, taking human form, lured Christians in their wicked palaces, where their faith was tested, priests were forced to serve mass in this damn place. Those who stayed alive were lucky enough, sometimes having returned home after a few years, did not recognize anything around. About demonic essence of Harlequin mentioned several literary sources. He was even in a scene of hell in Dante’s Divine Comedy, a common demon named Alikin, and his work was – stirring in boiling tar in the boiler with sinners. Here and there he was engaged in tormenting sinners in hell. That was not very nice beginning of his stage career. As time went by the name of Harlequin, his mask, brighty patchwork suit finally merged into one. But the final completion of the image happened in France. 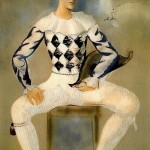 There the performer in Harlequin mask, Tristano Martinelli, decided to take the name as his theatrical nickname. 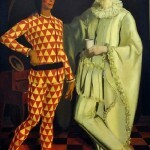 And Harlequin dressed for performances before aristocratic audiences in sewn from colored diamonds and triangles elegant skin-tight suit. His black mask almost lost its hair. And, of course, soon changed the character. 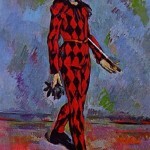 Harlequin became cheerful and naive, terribly amorous, besides a great joker and lover of amusing antics. Apparently devilish cunning disguise still peeking out from under a black mask. 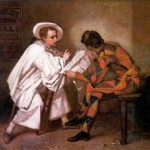 Harlequin was even presented to the royal court, and in his native Italy turned into a clever servant in comedies. 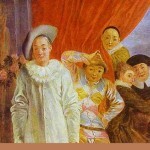 So we know him – in comedies and tales by Carlo Goldoni and Count Gozzi. And even when the glory of the commedia dell’arte had passed, the triumphal procession of Harlequin on the world stage continued. It got to the ridiculous. For example, in Germany in the 18th century, there were so many assorted Harlequins, called Hans Wurst, then Pickel Goering that they had to make a public burning of Harlequin at the theater of Caroline Neuber. But we remember what demon Harlequin did in the realm of the dead. So fire could only come to his liking. Adventures of Harlequin in Russia. 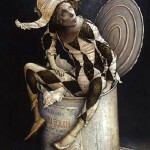 Playing in Puppet Show, fairs and masquerades, Harlequin quietly lived in Europe, waiting for the hour of his glory. And it came to him. But where? It is hard to imagine – in Russia, in the early twentieth century, which is usually called Silver Age art. It was there and while the wicked character was appreciated. 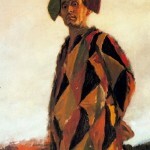 Harlequin won the Russian theater, poetic and artistic world. He was in vogue, the whole galaxy of talented creative people dedicated their art to him. Mocker in a colorful suit and black mask forced artists to paint his portrait, and real people became his prototypes, and sometimes its victims. 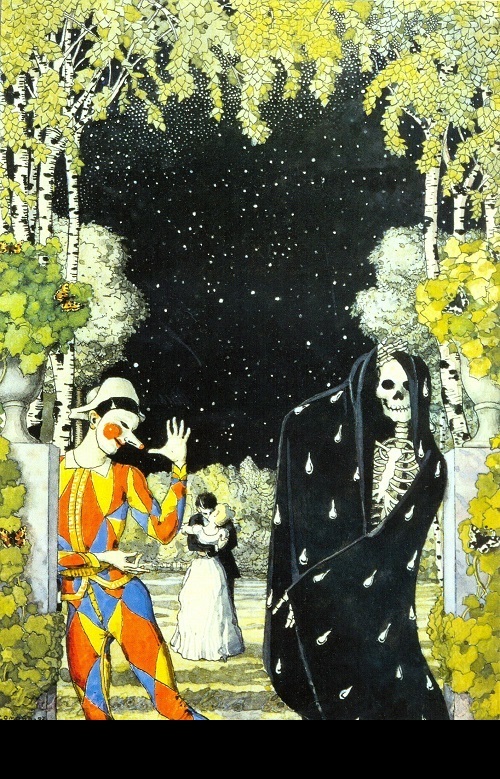 With the names of Harlequin and his unfaithful girlfriend Columbine and sad melancholy Pierrot connected a lot of broken lives and tragic stories. 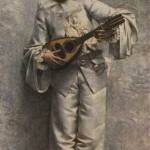 Andrey Bely, Alexander Blok, Anna Akhmatova, artists of “World of Art” movement, Vsevolod Meyerhold were strongly connected with the characters of the Italian Puppet Show. 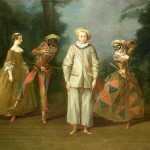 For each artist a figure of Harlequin appeared in a particular light, yet remaining mysterious. 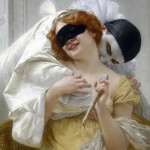 On the one hand, he was alive, vibrant, sensual, but under the mask could hide a lot, and puppet soul – the alive soul. Mysticism, waiting for the arrival of death, because all of them – dead dolls, designed by puppeteer, pulling the strings. 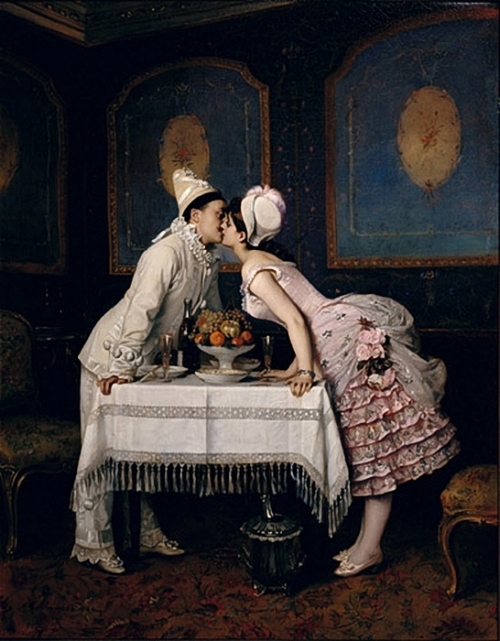 With this romantic “another reality” were fascinated all artists of the “World of Art”. 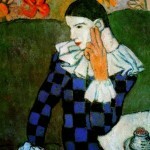 With the scent of the old comedy breathe naive paintings by Benoit, where our hero – Harlequin is rapidly moving from the rear wings to the dark foreground, where the old man declares of his love to the young coquette. Together with the Captain and Punchinello they strongly express a common desire – to destroy other people’s plans and to ridicule the fool (the elder). 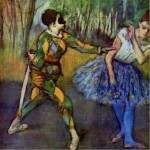 In another painting by the same artist – “Harlequin” (1900), next to our hero stands ready to help the owner to resolve feuds with other actors. Again near Harlequin is burning fire, this time – from the jaws of hell monsters. Another artist from the art world – Konstantin Somov was just obsessed with the glamorous theme of courtly life of the gallant 18th century. His Harlequins and Columbine live among palaces and parks, whirl in a carnival hectic intrigue. Behind their masks hides a powdered person or persons, all are living masks fearing of death, despair and devastation. 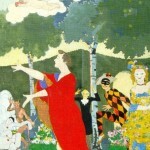 Konstantin Somov’s “Theatre” has become a cover for a series of books. There, the central places takes the skeleton, half-hidden under transparent cape – web, wrapping the character. Along the edges the Amur and the devil – the love and temptation. Black and scarlet-red glow adds mystics to theatrical performances. The two main characters in masks – Muses Melpomene and Thalia. 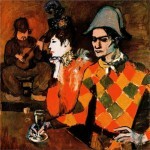 On the finger of Thalia, grinning and looking forward to his jokes, sits Harlequin – puppet with an enormous cartoon nose. He is small, twirling on her finger, but he is ready to take part in the upcoming booth with death and love. 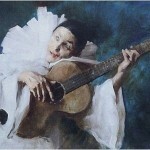 Another Harlequin by Somov comes most close to death. A young and very talented artist Nikolai Sapunov, as a theater artist, came with the troupe of Meyerhold to the shore of the Gulf of Finland. Once Sapunoff called Alexander Blok to St. Petersburg and invited him to the Carnival of “Fun night on the shore of the Gulf of Finland.” Something prevented Blok to accept the invitation, and he did not come. But Sapunov, Kuzmin, actresses and artists, went to ride on the sea. White Night. Two miles from the shore the boat turned over. Nikolai Sapunov could say: “Lord, I do not know how to swim,” and drowned. The body was washed ashore at Kronstadt in two weeks. Shocked by the death, Sapunov’s friends gathered and made a book of memoirs, short stories, poems dedicated to him. 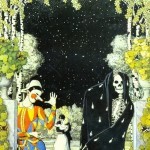 In its design took part Konstantin Somov. In one illustration he depicts the world of theater, filled with bizarre characters. Time and place of action – an eternity. Onstage, wrapped in white the drowned artist. Death in a suit of Harlequin throws mask off and shows his true face.